When I first asked De Nichols what title she would give herself, she said “I’m a curator of creative connections. A civic matchmaker. A creator.” Pretty nice, right? 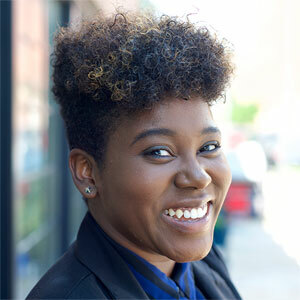 De is more than just a title though — her work helps changemakers nationwide actualize creative solutions to issues that matter most to them and their communities. We started off talking about her current work, including her activism work in Ferguson. We also talked about her organization Civic Creatives, and she gave some great advice on what designers can do to get involved in their communities to make change. De is such an upbeat and powerful force, and her enthusiasm for making the world a better place is infectious!